There’s something wrong when the number of young black men stopped by police in New York City exceeds the number of young black men actually living in the city. In 2011 the number of young black men stopped by police in New York City exceeded the number of young black men actually living in the city. The vast majority of them had committed no crime. Members of communities of color in New York City are also statistically more likely to be searched when stopped by the police, and more likely to be subjected to use of force than their white neighbors. This despite the fact that white people, when stopped, are twice as likely to be carrying a weapon. The mayor’s comments, which also included the bold assertion that “nobody racially profiles,” were made during a radio interview in which he was discussing a recent city council vote on two bills aimed to curb discriminatory policing in New York City. The package of legislation, known as the Community Safety Act (CSA), was voted on in a meeting that stretched from late Wednesday into the early hours of Thursday morning. The lawmakers voted to create an inspector general for the largest police department in the country and paved the way for a broader range of New Yorkers to bring legal claims against the NYPD for discriminatory policing and profiling. Enough votes were cast in favor of the measures to override a veto promised by Mayor Michael Bloomberg. In their call for increased accountability and transparency, the council members took a major swing at the shared law enforcement legacies of Mayor Bloomberg and NYPD commissioner Ray Kelly, who have argued the legislation amounts to an invitation for violence and possible terrorist attacks. Spearheaded by city council members Jumaane Williams and Brad Lander, the CSA is comprised of four bills, two of which were voted on this week; the NYPD Oversight Act (Intro 1079) and the End NYPD Discriminatory Profiling Act (Intro 1080). The NYPD Oversight Act seeks to create an independent inspector general monitor for the department and assigns responsibility for NYPD oversight to the commissioner of the Department of Investigation, which currently oversees roughly 300 other agencies in New York City, including the Fire Department, Department of Education and Human Resources Administration. The monitor would be responsible for reviewing NYPD operations, policies, programs and practices and would issue public reports. The monitor’s recommendations would be revisited annually. 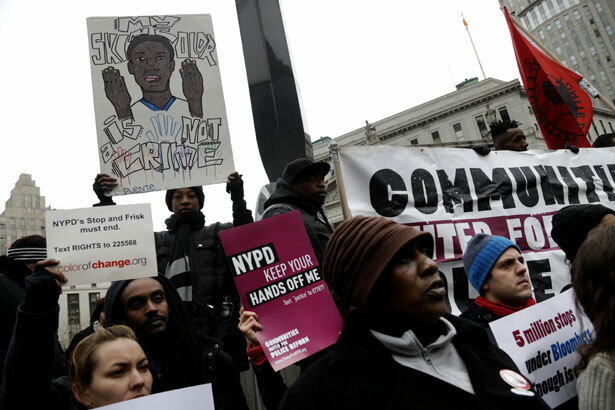 The End Discriminatory Profiling Act, meanwhile, aims to establish “a strong and enforceable ban on profiling and discrimination” by the NYPD, according to Communities United for Police Reform, and expand the category of individuals protected from discrimination. Currently, discrimination based on race, ethnicity, religion and national origin is prohibited. Under the proposed measure, age, gender, gender identity or expression, sexual orientation, immigration status, disability and housing status would be added to that list. The bill would permit individuals to sue the NYPD in state court both for individual instances of bias and for policies that disproportionately impact protected groups, though not for monetary damages. While the NYPD is no stranger to lawsuits and controversy, the Community Safety Act represents a challenge to the police department not seen in decades. Capitalizing on public gratitude for a record drop in murder rates since the 1980s and ’90s, as well as heightened security concerns following the September 11 attacks, Commissioner Kelly and Mayor Bloomberg have enjoyed immense law enforcement power and latitude over the last decade. In recent years, however, their policies have come under intense criticism, particularly the NYPD’s controversial stop, question and frisk practices, as well as its expansive, CIA-backed surveillance of Muslim communities throughout the Northeast. “New Yorkers know that we can keep our city safe from crime and terrorism without profiling our neighbors,” councilman Lander said on the night of the vote. If passed, the law would go into effect January 1, 2014, meaning it would be up to Bloomberg’s successor to appoint the NYPD’s monitor. The mayor has thirty days to veto the bills. If he does, the city council would then have thirty days to hold an override vote. The battle over the legislation is expected to last well into the summer, with the mayor’s office doing what it can to change the minds of supporters. Under Kelly and Bloomberg’s joint-tenure approximately 5 million New Yorkers—the vast majority of them black and Latino, most of them young men—have been stopped and sometimes searched by police on the city’s streets. According to NYPD data, approximately nine in ten stops have led to no enforcement activity—i.e., an arrest or a summons—and less than one percent have resulted in the recovery of a gun. Muslim communities, meanwhile, have expressed a feeling of pervasive fear following a series of stories by the Associated Press detailing how the NYPD—with active support from the CIA—has infiltrated hundreds of mosques, Muslim student groups and organizations and mapped entire Muslim neighborhoods in the years since 9/11, along the way gathering and storing information on innocent New Yorkers in the name of fighting terror. Outrage over perceived NYPD overreach, particularly on the issues of stop-and-frisk and surveillance, has spilled into the streets in the form of protests and rallies, resulted in landmark federal lawsuits and motivated intensive grassroots organizing in New York City, all of which have helped to create the environment in which the Community Safety Act has been able to garner support from local lawmakers.